﻿ Florida Snake Photograph 009 - This large Burmese Python is not native to Florida. This large Burmese Python is not native to Florida. DESCRIPTION: A large tan and brown snake. They come from Central and South America, but now they live in Florida as well. These massive snakes can grow up to 23 (7 m) feet long and weigh 200 (90 kg) pounds. Unlike most snakes, Burmese pythons have two long lungs, one significantly smaller than the other. Their skin can be gray, pale tan, or yellowish brown, and they have large brownish red blotches on their back which are outlined in a cream or gold color. Burmese pythons are constrictors who use chemical receptors and heat sensors to track prey. They will eat birds, domestic animals, mammals, and reptiles. They grab the victim with their sharp, back coiling teeth and vise-like jaws then squeezes the animal it and waits for it to suffocate. They then swallow their prey whole. Burmese pythons are native to China, Burma, Thailand, India, and the Malay Archipelago. They prefer to live in rainforests, but can also survive in grasslands, marshes, and swamps. The females lay up to 100 eggs in the spring and stays with the entire clutch until they hatch. Babies are around 12 to 18 (31 to 46 cm) long. Well-meaning parents have bought Burmese pythons for their children or themselves without realizing just how big the snake will get and they either escape or are intentionally released into the wild. In addition it is theorized that a large amount of pythons were released into the wild when Hurricane Andrew hit Florida in 1992. Either way, the Burmese python has found its way into the Florida Everglades and a breeding population was finally confirmed in the year 2000. Native mammals, who have not been subjected to a large boa-like snake in over 16 million years, have no fear of them and are being eaten in large numbers. Birds are also declining quickly. 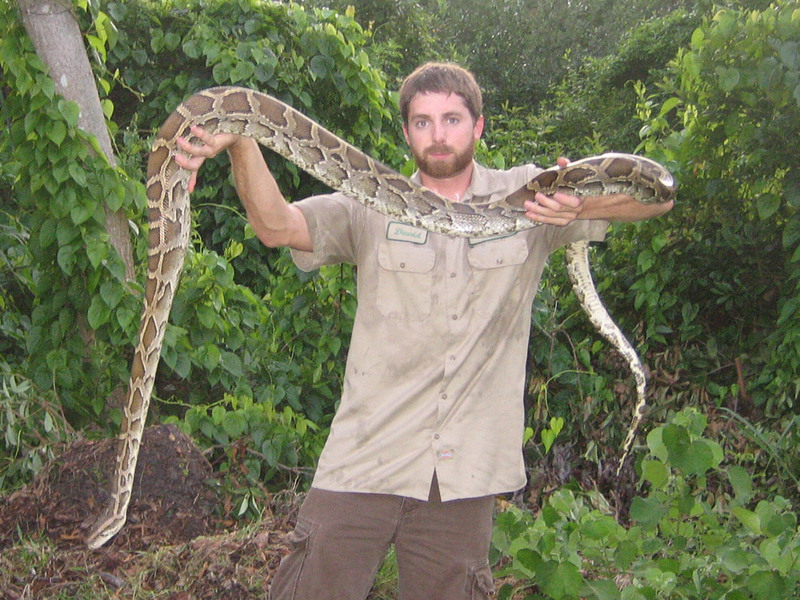 Burmese pythons are difficult to find because the Everglades are such a dense wilderness. There is not much ecologists can do but sit back and wait.